The Federal Reserve is widely expected to leave interest rates unchanged today. But perhaps standing pat with the target Fed funds rate at a mildly positive 0.25%-0.50% range should be viewed as a minor victory in the global context of monetary policy these days. Holding rates steady at just slightly above zero may seem like the poster child for dovish policy in the grand scheme of central banking history. But there’s a hawkish aura to Fed policy relative to the negative rates that are creeping into the global economy in other corners. In theory, going negative is intended to remedy sluggish growth and elevated recession risk and so the sight of positive rates is an encouraging sign for the macro outlook. On that basis, there’s trouble elsewhere. Six central banks—including the Bank of Japan and the European Central Bank (ECB)–have rolled out negative rates recently, according to the IMF’s count. The IMF, by the way, is on board with the policy, explaining earlier this month that “we support the introduction of negative policy rates by some central banks given the significant risks we see to the outlook for growth and inflation.” Leading the charge lower is the Swedish Riksbank, with a main policy rate of -0.5% and deposit rate of -1.25%. It’s no secret that the concept of negative rates is far from universally accepted as a change that promotes growth. The latest attack on the idea comes from the Bank of Korea, which predicted that the policy may prove to be counterproductive. “If economic agents accept the institution of negative interest rates as a bad signal, that the economy is shrinking or deflation is worse than expected, it may hold back economic activity,” the bank’s research note advised via Reuters. There may be a political cost as well, according to the German finance minister, who bluntly warned that negative rates are a key factor in the recent rise of the far-right movement in Europe’s biggest economy. “Ultra low interest rate policies are 50 percent responsible for the rise of the Alternative for Germany party”, charged Wolfgang Schäuble. Although he was forced to backtrack on the incendiary remark, it’s nonetheless striking to find such a high-level official demonizing—in overtly political terms—what’s become standard procedure at several central banks. Skeptics can point to job losses in some corners of the financial sector that are due in part to negative rates. As a recent story in The Wall Street Journal noted, negative rates in Europe are taking a toll on Spanish banking jobs. Spaniards set to lose their banking jobs in the coming months might fault their bank bosses. They should save some blame for Mario Draghi. Mr. Draghi, the head of the European Central Bank, has repeatedly cut interest rates to jolt eurozone economic growth. Last Thursday, he said the ECB was willing to use “all instruments available,” including additional rate cuts, to spur expansion. 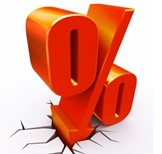 While some consumers and businesses have benefited from lower payments on their loans, subzero rates have chipped away at banks’ profitability. In Spain, this has forced banks to cut costs. The generous view is that sub-zero policy will eventually boost growth. Martin Malone, global macro policy strategist at Mint Partners, tells Bloomberg that negative rates are “buying time” in Japan and Europe to deliver firmer growth. Maybe, but there’s a damned-if-you-do-damned-if-you-don’t factor hanging over extreme policy decisions. Lena Komileva, chief economist at G+ Economics, notes that the ECB finds itself in a tough spot after going negative while Eurozone growth remains sluggish. “It’s criticized for not doing enough to stimulate growth…and at the same time, for doing too much in punishing savers, and pushing savers and insurance funds into taking more risks,” she notes via The Wall Street Journal. Meantime, there’s a guessing game of where negative rates are likely to pop up next. The option is off the table for the Federal Reserve for now, but tomorrow’s first-quarter GDP report is expected to be weak—a stall-speed gain of just 0.4%, according to yesterday’s estimate via the Atlanta Fed’s GDPNow model. If the nowcast is accurate, the debate about negative rates—from economic and political perspectives—may be set to heat up in the US in the weeks ahead.